I can’t really think of better fall patterns than plaid and tartan, and had been in search for some good pieces to add to my closet for some time. These Topshop trousers, found during last Wednesday’s pre-shop, were just what I had been looking for. And since the arrival of the print into my closet was a long time coming, I couldn’t help but go a little overboard with the pattern mixing and double up on the motif using one of the coziest scarves I own. « VIDEO: A Peek into my Closet! Stumbled across your blog a few days ago. 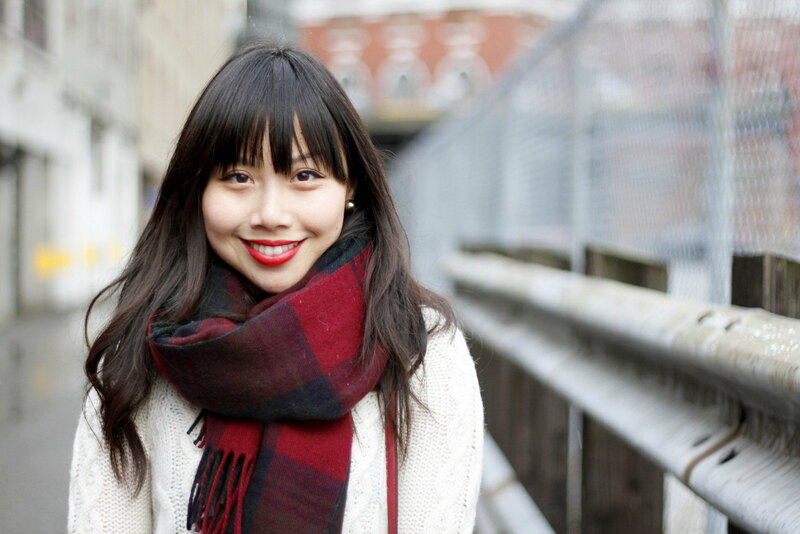 Love your style, love that faux leather skirt, and LOVE your best accessory: you have the cherriest smile! i love those pants and am such a huge fan of plaid and tartan. home run with this outfit!! I never would’ve of thought to mix those prints but they go together perfectly. Great outfit! Looks great! Love all the prints! Love all the different patterns going on in this outfit! Super cute look. Love the red lips! You are so cute!! I love your bag. Enjoy your weekend dear! Loving those plaid pants! And that cozy scarf as well. Aah!! I need something tartan in my closet. Maybe not trousers or shorts because it would look a little too Angus Young, but that scarf is incredible. Oh, you look super cute Jen. Coincidentally, I posted on plaid today too. Must be an October thing. I love all the plaid in your outfit, especially the scarf! You look so cute here! I am DYING over this outfit, Jen! It’s so perfect!! The pants are incredible (and my favorite type of plaid!) and the scarf is so cute and cozy! The dash of dalmatian is such a cute touch – print mixing perfection, miss Jen! ADORE! lovely outfit, love the pattern mix! Very cute – love the pants! looks incredibly warm .. you look stunning. This outfit is so fantastic, Jen! 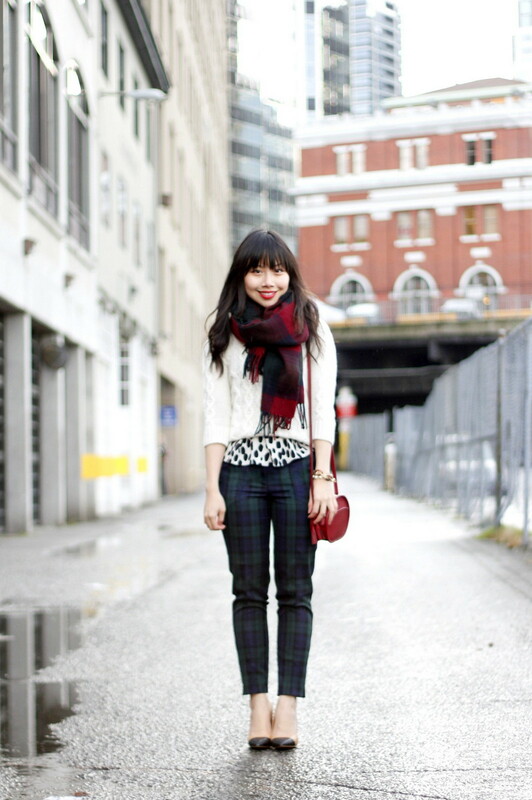 I love the pattern and texture from the plaid pants and scarf, dalmation-print top and cable knit sweater. 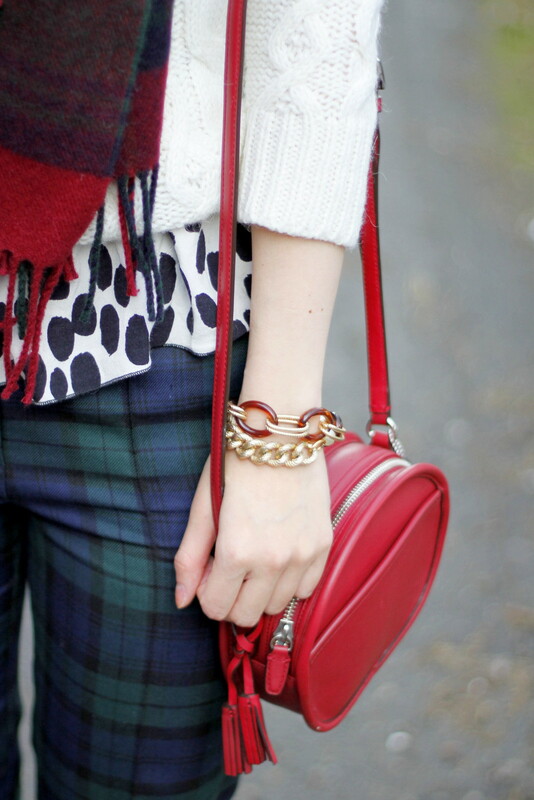 Plus the cherry red bag is the perfect bright accessory and your red lips are gorgeous. What lipstick are your wearing? Jen, this has got to be one of my most faved looks on you ever! i mean it’s a pretty hard-pressed thing to make choices when faced with all the lovely looks you share but i just adore those tartan pants and the blue, green, red colors together. you are darling as can be!!! okay and i LOVEY LOVE LOVE your new hair style. i was getting caught up here and saw you’d gone to Kore. after reading Alex’s review and now yours i think this is an appointment i must make asap. my hair hasn’t been cut in forever and is getting outta control with splits and thatchyness. boo urns! this cut suits you completely, he framed your face so well. can’t say enough good things lades, stunning is what! This is by far one of my favorite looks of yours, ever. SO PERFECT. The last shot of you is adorable – I love your smile 🙂 Great job mixing these different prints together – you styled this outfit beautifully. The prints you chose really make the red pop.